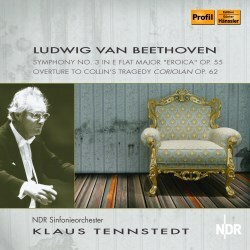 Tennstedt’s Eroica has, until now, been represented by his LPO/EMI recording of 1991, which is still available coupled with other examples of his Beethoven symphonic legacy with the same team. This Profil studio recording was made significantly earlier, in July 1979, with the NDR Symphony on good form in the well-calibrated acoustic of Hamburg’s Studio 10. If the feeling persists that Tennstedt, like many artists, is heard best live then this recording demonstrates that he could be equally persuasive in the studio with the red light glowing. There is sufficient rhythmic vitality here and the chording is strong without becoming trenchant. The orchestral choirs are well balanced, the strings remaining relatively lean and not at all opulent and the winds distinguishing themselves at numerous points. There’s no first movement exposition repeat, should that matter. There’s a modified kind of intensity though Tennstedt measures the approach to the end of the first movement with perception. The Funeral March emerges as a strongly textured affair, full of breadth but not marmoreal. There are no exaggerations of effect or of tempo, nor are there in the sinewy scherzo – the sinewy effect is perhaps exaggerated on occasion by the recording quality which can turn glassy at fortes. Tennstedt returned to the Eroica in Vienna in 1982, so collectors of the conductor’s Beethoven now have three different performances from which to choose from three successive decades. The coupling here is the Coriolan overture, recorded at the same sessions. It’s neither as penetrating nor as dramatic as some – I recall a Jochum recording with particular enjoyment, for example, amongst many recorded at around the same time as this one – but it has a craggy kind of honesty about it and a reluctance to grandstand that makes it a worthwhile companion to the symphonic performance. Given the above, recommendation will depend on whether one already has a Tennstedt Eroica. The Vienna performance is the best played, the LPO the best recorded but this NDR also has its considerable virtues. I doubt duplication is necessary.